Bundt Pan Roasted Chicken is the tastiest bird you'll ever bake! Easy as can be, in a bundt pan roasted chicken and the juiciest bird ever! I personally think this chicken is the best-roasted chicken even over a supermarket on the rotisserie! It's juicy, moist and very flavorful. I can't wait to make it again, scroll down and see just how easy this is to make using a bundt pan! Great leftovers for making the chicken salad too! I just love this meal all in one pan. It's so easy and the chicken stays so moist and juicy! You can add just about anything around the bottom of the pan of vegetables your family likes too. What an Easy Clean Up Crisp Roasted Chicken! There is one thing I love about cooking more than easy recipes, clean up! This one is simple, easy to make, delicious and easy to clean! If you don't have a bundt pan it's a must-have! You can easily order one from my affiliate shop above. I really do love the flavors in this lemon, herb and spice chicken and lemon really keep the juices flavored inside. Check out some of the tips below. I love using this chicken on top of salads, sandwiches like panini and the best way is fresh out of the oven. If you are lucky enough to have leftovers count on the best chicken salad you will ever make! Great flavors and so tender. Just add the vegetables around the bottom of the bundt pan like potatoes, broccoli, carrots and any other you like! Fun to Cook in a bundt pan! I love cooking in a bundt pan it's really a lot of fun and easy to clean up! Just remember to cover that middle hole in the center with lots of foil to keep it from dripping into the oven. I use a heavy duty foil to cover it so it doesn't rip easy. Easiest Cleanup and Juiciest Bird EVER! 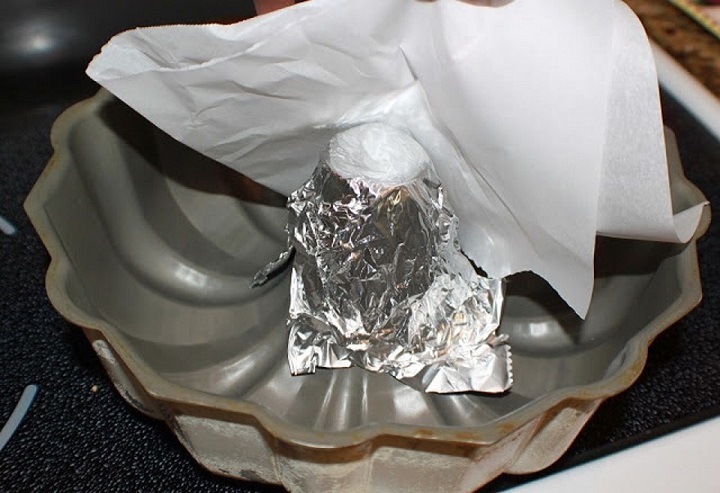 I make sure to cover the hole in this bundt pan very well with parchment and then foil to make sure there is no leakage. I also like to tent it just folded over lightly making sure it doesn't splash all over. That was one of the tips I wrote down after I made it this way. There are so many flavors you can try that you like. I listed some ideas in the main recipe. Make it Asian style, Mexican flavors, whatever you like to change the seasonings. I have made this with mushrooms, peppers, tomato sauce over the top and it was excellent. You will have to add the sauce the last 1/2 hour so it doesn't burn. Just roasted the chicken with peppers and mushrooms. That's a whole other meal Italian style! Last this chicken making it this way makes the best leftovers as the taste is universal for chicken salads, pot pies or just topping salads. Club sandwiches are terrific using this leftover chicken with some bacon, lettuce and tomato. Fresh herbs always make the best tasting roasted chicken. If you have to use dried make sure you put a good amount all over the bird. Fresh is heavier in flavors than dried. This bundt pan roasted chicken is the best way I can ever hope for using my oven as a rotisserie. No more supermarket roasted chickens, this bundt pan chicken is that simple, delicious and tasty! rosemary and Parmesan cheese all over the bird before baking. Note: always use fresh herbs when you can. I add beer or white wine on the bottom and keep the pan moist. You can also add lemon juice and water if you prefer. Ranch dressing or Duck Sauce and grated orange rind. Or just sprinkle with whatever seasonings you like Cajun or Mexican style or even Asian flavors using soy sauce and oyster sauce. Lemon and garlic are our favorite. Roast the chicken on 425 degrees until crispy around 1 hour or until juices run clear. If your bird isn't crispy enough but cooked, put under a broiler for a few minutes on high. Don't Forget to Try My Slowcooker Chicken Cacciatore! Using your Bundt pan like a beer can is a great idea. I've never heard of this and need to try it. I love that I don't have to buy another gadget! I'm trying this with our next roast chicken!! This is a great idea! Now I can use my bundt pan! That's a very clever alternative to using a beer can, and I love how the bundt pan collects all of the lovely chicken juices! Just love this idea! What a great idea! For some reason I don't have a bundt pan (it's like I have everything in the world except that...). I guess I need to go buy one now! This is so creative! Such a great dinner option! Looks absolutely amazing - so perfectly cooked and the golden crust is gorgeous! I need to try this asap - I've always wondered how not to make a huge mess - now I know! This is genius way or making roasted chicken, I love this idea. Yes it has crispy crust . YUM!!! 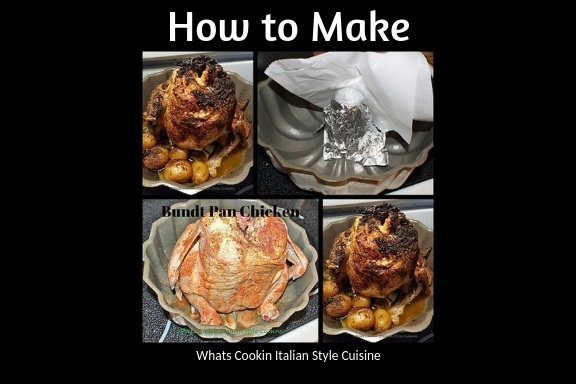 I can not wait to try this Bundt Pan Roasted Chicken! Looks incredible! This is a great idea for dinner for me and my family. I really like. I want to try it immediately, and I'm sure it is very tasty! Thank you for sharing this great recipe! Pinned for later! Now that’s a terrific idea. Never thought of using my bundt pan to bake or roast chicken. Love it. Thanks for then new idea and recipe! We've been making drunkin' chicken on the grill for years. It's one of our favorite ways to make the bird. We've never tried it with a bundt pan -- interesting concept. We'll have to give it a try when it's too rainy to make the chicken outside. That is a fun way to roast a chicken. It is so interesting to see different techniques to use the gadgets we already have at home instead of investing in new ones. I have so many pots and pans that I have hardly used. Now this is one more use to the couple of bundt pans I own. I am so going to try this next time I roast my chicken. Thanks for this post! That chicken looks amazing! Wow that is one clever idea of roasting a chicken! looks perfectly done! Great dinner idea! What a great idea - I never would have thought of this! I love how you give so many different ideas for how to season it too! 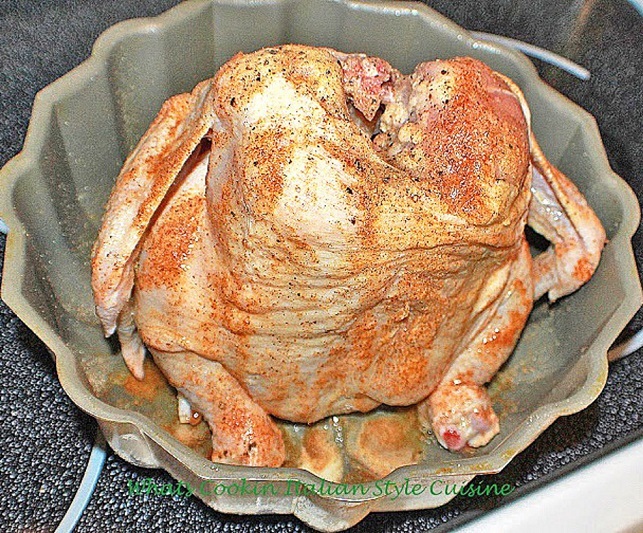 Wow, roasting chicken in the bundt cake pan - that sounds very innovative and a great double use for bundt cake pan. Cooking veggies in the bottom of the bundt is another great idea. 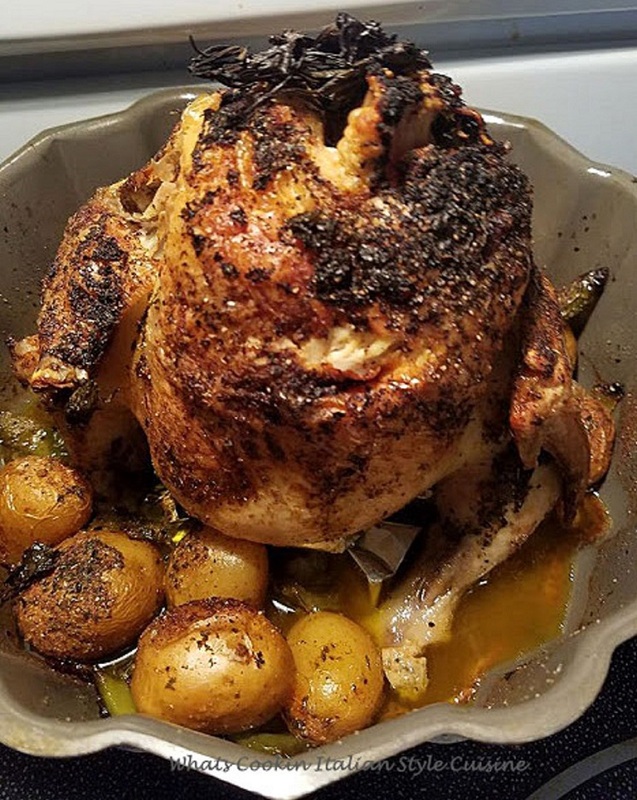 The use of the bundt cake pan is genius, I have cooked a chicken like this but using a metal tower it does make sense to use the bundt cake as all the juices are kept in the pan. I have a bundt pan that I use for just making roast chicken and savory things. Such a clever idea to make chicken roast in there. Love the flavors on this chicken. Sounds yum. 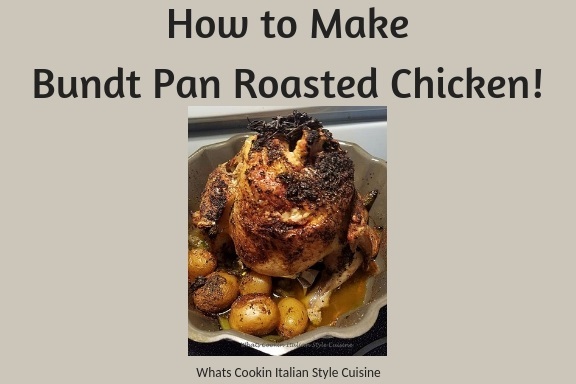 I heard of using a bottle to roast the chicken, but i never thought of using a bundt pan. What a creative way to make a chicken dinner! What a great way to use all of my kitchen tools. Never would have thought to roast chicken in a bundt pan. I love this recipe!! What a great idea to use a bundt pan and fresh herbs are always a must. Using beer or wine is absolutely perfect with this recipe and I love that you incorporate those flavors too. Beautiful! What a great way to make indoor beer can chicken! I can't wait to try this with my bundt pan! What a great idea! I'd never think to use a bundt pan! Such a unique way to cook chicken. I need to try this soon. New way to use the bundt pan!! This looks amazing!! I love this idea. I can not wait to try this, especially with all different flavor ideas that you just wrote about. This is such a fun idea! Never wiuld have thought of chicken in a bundt pan! What a super creative idea! I love the idea of using a bundt pan! 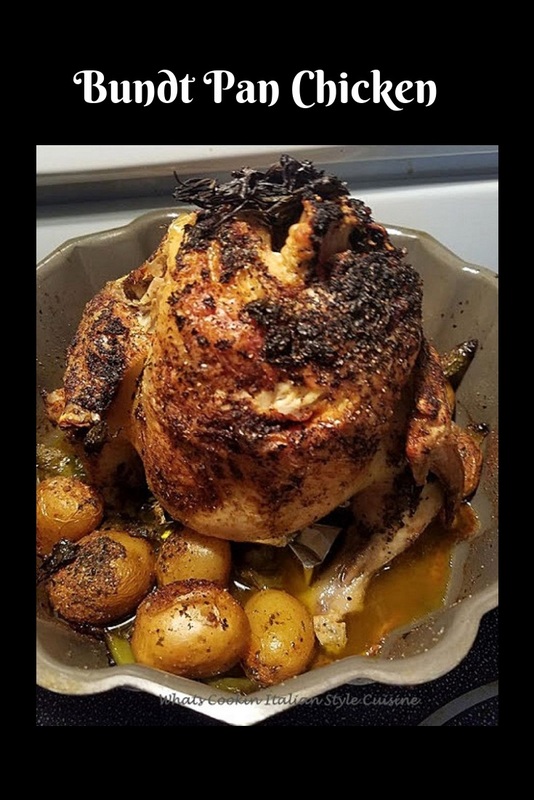 Didn't know it is possible to use bundt pan for roasting chicken like this! Thanks for sharing. Looks delicious! What a great idea! so creative! I definitely want to try this bundt pan chicken. Yours looks perfect! 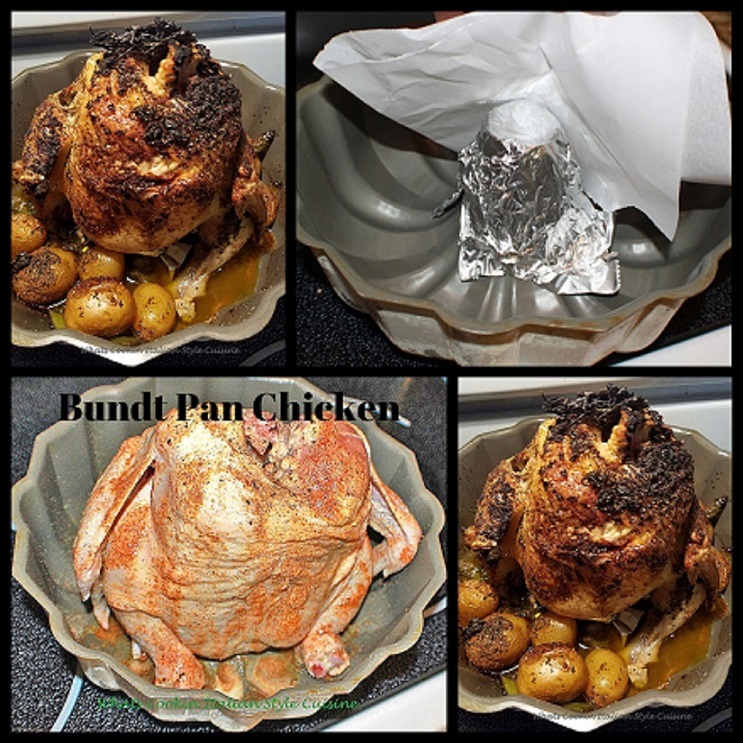 What a great idea using a bundt pan to make roasted chicken! My family loves chicken. We will definitely try your recipe. I'm sure I will enjoy this recipe. Great idea for a festive table. 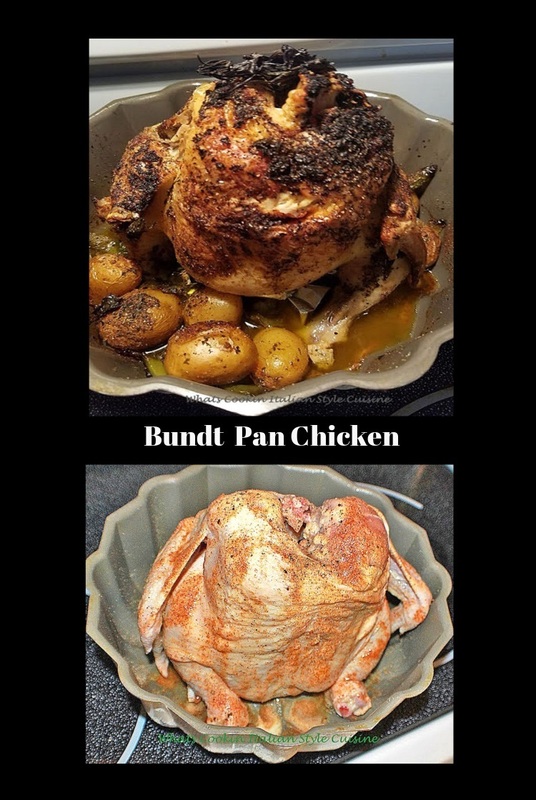 I saw on Facebook this bundt pan chicken and it's been on my mind to try it out - I think it's an incredible idea. And such even cooking. What a great way to prepare chicken! I love this idea so much - i hate soggy bottomed chicken, this solves it!